When planning a holiday to Bali, there are three items that typically appear on every itinerary: white-sand beaches, turquoise waters and beachside cocktail bars. While these must-haves are hardly few and far between, the popularity of Bali beaches has given the Indonesian isle a reputation for bordering on overcrowded and overdeveloped. The thing is however, Bali is quite literally surrounded by beautiful beaches, and it’s only too easy to find a little slice of heaven to call your own. If you get off the traditional tourist circuit and explore the beaches less travelled, you’ll discover a dazzling island paradise offering natural beauty and a sense of adventure. Here are our some of our picks for the best Bali beaches (that aren’t Kuta). 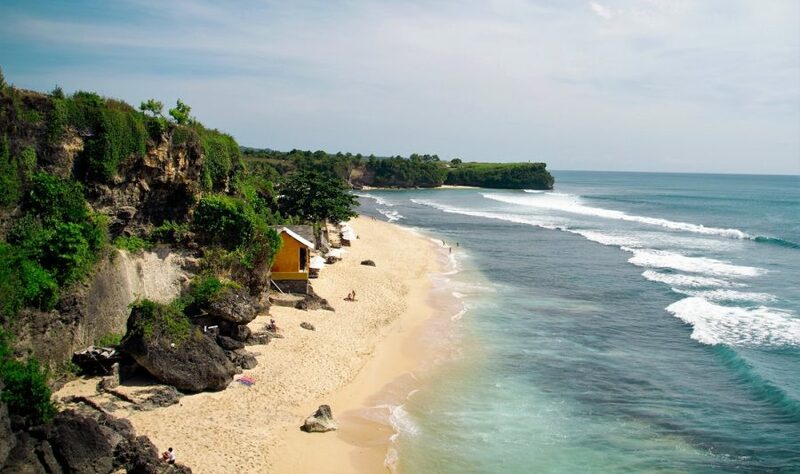 The island’s south peninsula is a haven for hidden gems, and Bingin is one of the best not-so-well-known beaches in Bali. Popular with surfers and sunbathers alike, Bingin Beach is an oasis of perfect waves and sandy coves. Located at the bottom of a cliff, you’ll first need to navigate your way down a series of uneven, rocky steps, but as they say, nothing worth having ever comes easy, and this tropical hideaway is well worth the trek. Just a short walk from Bingin Beach, Padang Padang Beach is home to dramatic rock formations and stunning coastal scenery. This is one of the Bali beaches you might already be familiar with, as it provided the backdrop to film adaption of Eat, Pray, Love with Julia Roberts. Happily though, it hasn’t lost any of its natural charm. Offering some of the best surf in Bali, Padang Padang also hosts the Ripcurl Pro Padang Cup, and attracts first-class surfers from around the world. If surfing isn’t your thing, be sure to stop by in the morning instead to watch the sunrise, as this is when Padang Padang Beach truly shines. Located in Nusa Dua, Geger Beach is a peaceful slice of paradise that’s still close to the action. The beach offers a wide stretch of sand, making it a go-to destination for those looking for a game of volleyball, yet its calm waters mean it’s also popular with paddle boarders and swimmers. If you time your visit just right, you can also watch the seaweed farmers at work between Geger Cafe and Geger Temple. Balangan Beach attracts the boho, backpacker types who prefer a laid back, tropical vibe over the chaotic party scene of places like Kuta. The beach is located on the Bukit Peninsula, north of Bingin Beach, and provides the ideal setting to really shake off the stresses of city life. The aquamarine waters can be enjoyed by swimmers at high tide, while the lounges and hammocks sprinkled along the shoreline provide a perfect refuge for watching the surfers hang 10. The beach is blessed with waves for both beginners and pros, so if you want to give surfing a try, there are a number of surf schools and freelance instructors in the area who will happily take you out. If you’re game to tackle the 250 steps that lead 75 metres down a cliff to Green Bowl Beach, you will be rewarded with a secluded strip of sand that’s perfect for an intimate coastal escape. Framed by two large limestone caves, this Bali beach is named after the emerald hues offered by the algae covered rocks in the water. Bring some lunch and spend the day soaking up the sun far from the tourist hordes. Just don’t be startled if you find yourself sharing this secluded Bali beach with some monkeys! Far from the hustle and bustle of Kuta and Seminyak, Pemuteran is one of the best Bali beaches for snorkelling and scuba diving. Located four and a half hours’ drive from the airport in Bali’s north-west, Pemuteran is situated right on the edge of the West Bali National Park, and offers a wonderful reprieve from the tourist cohort. Hire some goggles and a snorkel and make your way into the water to explore the artificial Biorock reef, or jump on-board a dive boat to Menjangan Island and enjoy some of the best underwater adventures to be had on the island. If you choose to stick to the shore, the beach’s fine black volcanic sand is perfect for sunbathing or simply for taking a leisurely stroll. Bali beaches are the stuff of legend and you can discover them all with cheap flights to Bali on Webjet. You can also find Bali holiday packages to bundle your flights with accommodation.